Stanley (Woolooga Hay Drive), GRC Mayor Mick Curran, Tom Grady, GRC Councillor Hilary Smerdon. Gympie’s local Disaster Management Group has stood down and moved into recovery mode as of 8.30am this morning and are in the processes of assessing the needs of affected residents. 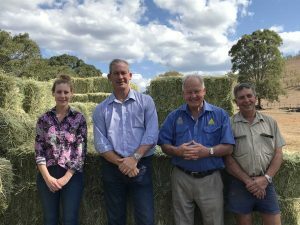 Gympie Regional Council is urging members of the community who wish to purchase hay bales for the hay drive to contact Tom Grady’s team on 5482 1692. Similarly, if you have existing hay to donate please contact the Woolooga Hay drive and speak with Peta on 0448 824 970. 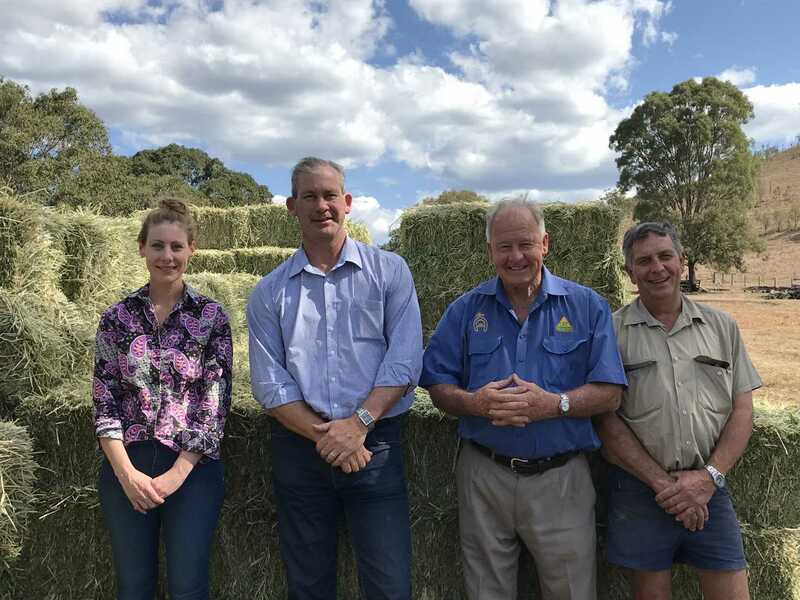 For residents who need access to hay, call Council on 1300 307 800. Council are also advising that tanks in the area of the fire could be contaminated by some of the firefighting material used. If you hold concerns that your tank is contaminated, please call 1300 307 800 and ask to speak with one of Council’s Environmental Health Officers who will be able to provide assistance. If fire-affected residents need access to tank water and are able to self-serve, Council will have cards available to access Water Fill stations in Gympie for free. Residents can collect these cards from the Woolooga Hall from tomorrow (Tuesday, September 25 2018) at 12pm. For those residents who have fixed tanks, contact Council on 1300 307 800 and arrangements will be made to deliver water. Free drinking water is also available from a water tanker opposite Woolooga Hall. Council understands fencing will be needed for affected properties. We are asking residents affected by the fires to register with GIVIT and explain your fencing needs. Residents with fencing needs should visit GIVIT at www.givit.org.au. GIVIT will then be in contact. If you need assistance with registering, recovery staff are on hand at Woolooga Hall. Bin services will run Tuesday as scheduled and affected residents can use both bins if needed. Residents can call Council regarding any further waste issues on 1300 307 800. Department of Agriculture and Fisheries will be at Woolooga Hall from 12pm today to discuss affected residents’ needs. You can also contact Department of Agriculture and Fisheries directly on 132 523. Anybody wishing to donate can visit www.givit.org.au. This is the central point for all donations for the Woolooga fire. Council is working with the community on where the money is needed, with GIVIT purchasing relief items essential to the recovery. For safety reasons, Council are advising those travelling through the area to be alert for stock on roads and downed fencing.